Satan often disguises himself with the purpose of deceiving people. One way in which I believe he is putting on a masquerade is by appearing as “Mary” to millions of people worldwide. Marian apparitions reportedly began as far back as the 4th century and even allegedly back to as early as 40 A.D. (http://www.mycatholicsource.com/mcs/pc/the_Blessed_Virgin/apparitions.htm). 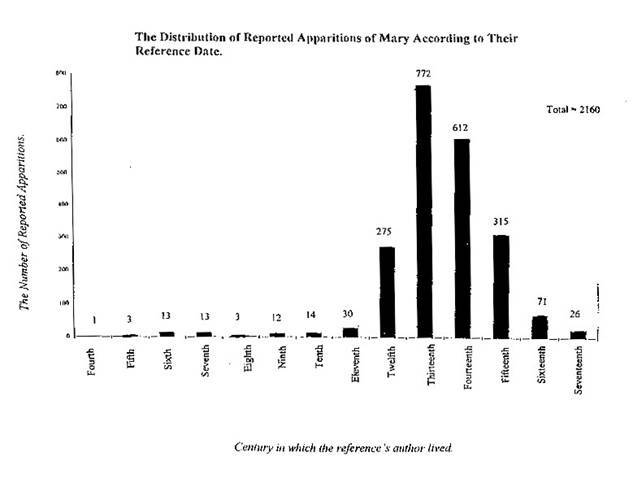 There were a reported 2160 Marian apparitions from the fourth century to the seventeenth century. There have been another 458 apparitions in the twentieth century from 1900 to 2011 alone (http://campus.udayton.edu/mary/resources/aprtable.html) so the sightings have been increasing. Each year one million people visit Medjugorje (http://en.wikipedia.org/wiki/Medjugorje) and “millions of pilgrims visit apparition sites annually” (http://marysaggies.blogspot.com/2012/04/10-things-to-know-about-marian.html). I am going to show in this document that the apparitions of “Mary” appearing all over the world are not Mary the mother of Jesus Christ, but likely of Satan himself. Remember that the devil can appear as an angel of light (2 Cor. 11:14). What better way to fool people than to show up masquerading as the beloved mother of Jesus Christ with a baby in her arms? Following are some titles of Mary given by the Catholic and Coptic churches as well as quotes from the apparitions themselves. Of note is the fact that this “Mary” is being called and is calling herself “the morning star”. And for woman, shining one. Blessed in turn all women too. Blessed they with peaceful spirits. Blessed they with gentle hearts. But this “Mary” is not the first and only demigod to bear the title “morning star”. Interestingly even Muslims acknowledge Mary, particularly with reference to the apparitions at Fatima since that was the name of one of Mohammed’s wives. Apparently the following quote comes from a person who does not understand that, in the Koran, Allah is said to not have either a wife or a son. Morning Star: This is a very instructive title where Catholic theologians have stated that Mary got this title after Lucifer was thrown out of heaven. The translation by Jerome of Lucifer meaning “morning star” is actually not accurate. So whether or not you call Satan “Lucifer” or know that that is not his name in heaven before the fall, that fact of the matter is that Jesus was given the title of “bright and morning star” after Lucifer was thrown to the earth, this title showing the Jesus is greater than the angels. There is no mention of Mary being given this title in the Bible, nor was she or is she an angel. Catholic “theologians” try to use the reward for those who overcome in life and in eternal life receive “the morning star” (Rev. 2:28) which is probably referring to Jesus Christ. They also try to use 2 Pet. 1:19 which is also talking about after the resurrection, not now. This reward is for all believers after death, so this Marian apparition cannot exclusively claim this title to itself. But we must remember that the enemy was called “the morning star” or “son of the morning” before he fell (Is. 14:12) and is under no obligation not to lie about this title still belonging to him. The fact that the apparitions of Mary have stated that she is the “morning star” should be a clue to the identity of this imposter. What better way to fool the world than for the evil one to appear as an “angel of light” in the form of Mary, the mother of Jesus, who is also often seen with a baby in her arms. This baby cannot be Jesus as He is in His adult glorified body sitting at the right hand of the Father as the God-man for all eternity, and if He is seen in any other way it is a deception by the enemy. Of course only Jesus Christ is called “the bright and morning star” in the Bible (Rev. 22:16). We also need to look briefly at a number of other heretical titles given to this “Mary”. Let’s deal with some of the more heretical titles given to Mary and spoken of by Marian apparitions from a biblical perspective. Mother Of God: Though Mary was the “mother of God” in the sense that she bore Jesus Christ the Son of God by the Holy Spirit where Jesus added humanity on to His Divine nature thus becoming the “God-man”, she is not the mother of God in heaven as He is self existent (John 5:26). Immaculate Mary: The true Mary, while she was alive on earth, declared she was a sinner in need of a Savior (Luke 1:47), thus she was not “immaculate” but a true human being born with a sinful nature. If she had not been a true human then Jesus could not have died for our sins because only a blood sacrifice can atone for sin (Heb. 9:22), and Jesus died once for all to accomplish that (Heb. 7:27), being both fully human and fully the immaculate Son of God (Rom. 3:25). Cause of Our Salvation: If they meant that Mary had a part in the salvation plan of God by giving birth to Jesus that would be true in one sense, but she was not the cause of our salvation. That was the plan of God set forth from the beginning (Eph. 1:4). Advocate of Eve: No one would advocate for Eve as she was deceived by the enemy and brought Adam into sin which has affected all mankind. There was an advocate there, that day, however and that was the enemy advocating for man to join him in the big lie and hell. Star Of The Sea: This sounds like a pagan title and indeed is has pagan origins. There have been many false gods ascribed to be the “god of the polestar” such as Amenominakanushi of Japan. Mary is not the god of the polestar nor is YHWH. Ark Of The Covenant: Nowhere in the Bible does it link Mary to the Ark Of The Covenant since she came long after the Mosaic Covenant, though she participated in God’s plan to establish a New Covenant in Jesus Christ. Co-Redemptrix: This is a blasphemous statement about Mary as only Jesus Christ can save (John 14:6). Salvation is by grace alone (sola gratia) through faith alone (sola fide) in Christ alone (sola Christus). Destroyer Of Heresy: As mentioned above, the belief that Mary can forgive sins is heresy. Therefore this cultic following of Mary is the very definition of heresy, which the apparitions of this demon have failed to correct. Gate Of Heaven: There is only one reference to the “gate of heaven” in the Bible (Gen. 28:17) which was an exclamation of Jacob when he dreamt of a stairway to heaven. There is no correlation to Mary to be found in this or any other passage of the Bible. The Immaculate Heart: See “Immaculate Mary” above. Mother Of Our Creator: Again, see “Mother Of God” above. God has no mother. He is self existent (John 5:26). Queen Of Angels: Mary cannot be a “queen of angels” because she is not an angel. But Satan could claim to be the queen of angels because he was one of the head angels before he sinned and fell. Queen of Heaven: There is a “queen of heaven” mentioned in that Bible which referred to Asherah, wife of one of the Baals, a continuation of the worship of Nimrod & Semiramus. Asherah is identified as the consort of the Sumerian god Anu and Ugaritic El, the oldest deities of their respective pantheons. (http://en.wikipedia.org/wiki/Asherah) The worship of the “queen of heaven” was not a good thing but is a cause of the anger of God. Jeremiah 7:18 The children gather wood, the fathers light the fire, and the women knead the dough and make cakes to offer to the Queen of Heaven. They pour out drink offerings to other gods to arouse my anger. Jeremiah 44:17 We will certainly do everything we said we would: We will burn incense to the Queen of Heaven and will pour out drink offerings to her just as we and our ancestors, our kings and our officials did in the towns of Judah and in the streets of Jerusalem. At that time we had plenty of food and were well off and suffered no harm. Jeremiah 44:25 This is what the Lord Almighty, the God of Israel, says: You and your wives have done what you said you would do when you promised, ‘We will certainly carry out the vows we made to burn incense and pour out drink offerings to the Queen of Heaven.’ “Go ahead then, do what you promised! Keep your vows! Queen Conceived Without Original Sin: Mary was not a queen nor was she conceived without original sin. This is another damnable lie without any Biblical support. Ravisher Of Hearts: I don’t know what this title means but it sound sinister. God does not “ravish” the hearts of men, nor would His servants. It is the devil who wants to cause people to fall in love with him, which he is doing by means of these worldwide apparitions. Refuge Of Sinners: Mary is not a refuge of sinners as she is long dead and awaiting glorification with the believers on the day of the resurrection. The Psalms often speak of God being our refuge but there is no mention of Mary being our refuge anywhere in the Bible. Seat Of Wisdom: Mary was an ordinary person who was chosen by God to bear His Son. She is actually not a good model of wisdom to follow because she did not recognize who Jesus really was for a long time as evidenced when she wanted to interrupt His ministry along with His brothers (Mark 3:31-34). There is also not reference to a “seat of wisdom” in the Bible. Tower Of David: There is nowhere that Mary is mentioned as the “tower of David”. This phrase is only used once in Song of Songs 4:4 where it is an allegory of the relationship of Israel to God and the Church to Christ. First of all, Mary is giving the same kind of psychobabble advice that Oprah Winfrey, Robert Schuller, Rick Warren, Joel Osteen and others have popularized but is in direct opposition to what the Bible teaches. We are not called by God to learn to love ourselves, which is what we know how to do better than anything, but to learn to love God and love our neighbors as ourselves (Luke 10:27), to take up our cross daily, denying self, and following Christ, not Mary. Secondly, a person cannot recognize the Son in unbelievers, only if they are a believer and have unity of the Spirit through the Gospel. This is the fallacious teaching of people like Tony Campolo. Thirdly, the Son is not preparing Christians to do works “through” Mary, but through Jesus Christ prepared by the Father. Satan already has the rule of the world. This is a great deception and another reason why I believe these apparitions are of Satan. Jesus did not correct Satan but rebuked Him from the written Word. There are other places that talk about Satanic dominion in the world. Colossians 1:13 For he has rescued us from the dominion of darkness and brought us into the kingdom of the Son he loves. Those who are truly born again have been rescued spiritually from the dominion of the enemy, but they still live here in body and soul in a world that has been given to the devil temporarily. Christians will never “heal the world” but can preach the Gospel and disciple believers from all nations in order to prepare for Christ’s physical Kingdom in the Millennium. We are not called to become children of Mary, but of Jesus Christ through the new birth. That this “Mary” who is not really Mary the mother of Jesus Christ whose spirit is with the Father in Paradise and not roaming the earth holding some “child” she called “Jesus”, would draw followers to herself shows that she is none other than Satan who, long ago, was thrown out of heaven by trying to get the angels to worship him. Is. 14:13-15 You said in your heart, “I will ascend to the heavens; I will raise my throne above the stars of God; will sit enthroned on the mount of assembly, on the utmost heights of Mount Zaphon. I will ascend above the tops of the clouds; I will make myself like the Most High.” But you are brought down to the realm of the dead, to the depths of the pit. Not only do her followers repeat the lie of Mary not being a sinner, but the apparitions do also. This little “Jesus” speaks and goes against his own teachings that we are no longer held captive to the Law of Moses but are now under the Law of Christ, which is love. He also allegedly makes the Catholic sign of the cross, which is a sign that was taken from Babylonian worship when the Catholic religion was first sycretized. I (Mary) alone am able still to save you from the calamities which approach. Those who place their confidence in me will be saved. Teiji Yasuda, O.S.V., English version by John M. Haffert, Akita: The Tears and Message of Mary, Asbury, NJ, 101 Foundation, Inc., 1989, p. 78. Message from Our Lady of Akita to Sister Agnes Sasagawa. Only Jesus Christ is able to save, not Mary. This apparition is saying God said something that He never said. God’s provision of salvation does not include devotion to a “Mary” who never was. My daughter, in this time, I am the Ark, for all your brethren! I am the Ark of peace, I am the Ark of salvation, the Ark where my children must enter, if they wish to live in the Kingdom of God. Bishop approved. These are apparitions in which the local Bishop (Ordinary) has investigated the apparition and its message and given his seal of approval Imprimatur. This means Catholics can (but are not required) to visit the apparition site and listen and obey the messages. Messages of Our Lady at San Nicolas, Milford, OH, Faith Publishing Company, 1991, p. 233. Message from Mary given in San Nicolas, Argentina to Gladys Quiroga de Motta. Mary is not the way to salvation. Only Jesus Christ (John 14:6). The fact that this apparition is going directly against what the Bible teaches and the Gospel proves it is a seducing spirit teaching doctrines of demons (1 Tim. 4:1). Not officially church approved, but it is endorsed by dozens of Cardinals, Bishops, and the Pope himself. "Our Lady of Medjugorje," message given Aug. 25, 1992, Online posting, http://www.medjugorje.org/msg92.htm, Sept. 28, 1998. God does not ask people to “open themselves completely to Him” but to believe and commit to His Son. The devil wants people to give him a foothold (Eph. 4:27) by “opening” themselves to him. The above information leads me to the conclusion that, not only is the real Mary, mother of Jesus, not appearing all over the world but that the devil is deceiving millions with these apparitions. I believe that God always provides, those believers who have discernment, clues as to what the devil is up to. 2 Cor. 2:11b For we are not unaware of his schemes.